I recently completed training at the Hansgrohe USA manufacturing and Aquademie training facility located in Alpharetta, Georgia. 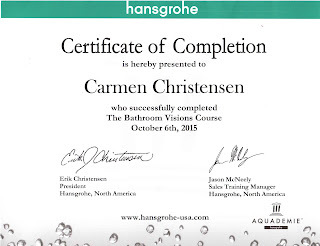 It is a training course I have been hearing about from my peers for a few years and I was so excited when my name was selected in a drawing during a local ASID event inviting me to attend Hansgrohe’s Aquademie Training. Though the company headquarters still remains in Schiltack, Hansgrohe has become a global brand in over 140 countries around the world. Hansgrohe is steeped in history and with their think-tank approach to design and products they have proven that they are innovators and leaders in the revolution of the shower. 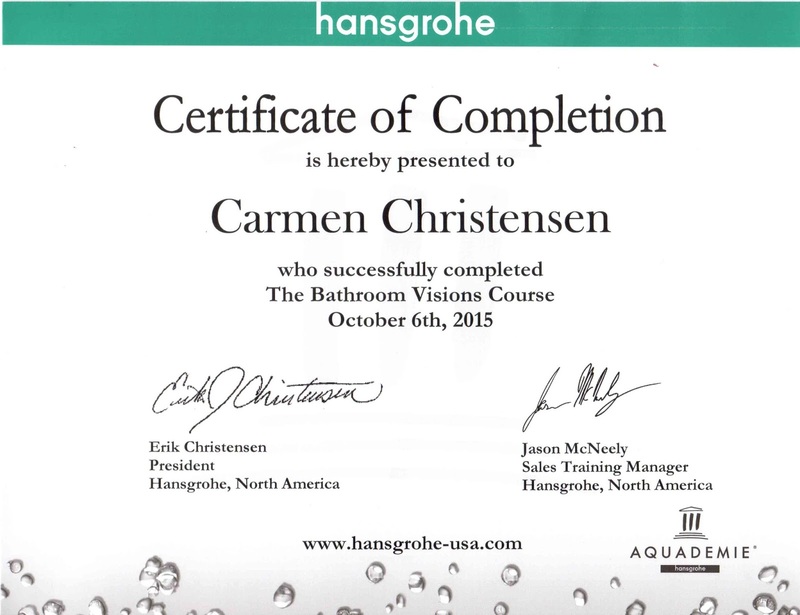 I was one in a group of about 20 brought to Hansgrohe to attend their Aquademie training. After a few hours of training and learning all about Hansgrohe’s history and their many innovations in the shower, we were told we could give them a try and see for ourselves. What better way to experience the truth behind the words than to be able to “try them out”. Inside the Aquademie training center is a super-sized over the top shower room they aptly call “Showerworld”. It is a beautiful spa like area that showcases every Hansgrohe shower head and they are all fully plumbed, available, ready and waiting to be tested and tried out. I was able to go into their super-sized shower room they call “ShowerWorld” and test out all of their showerheads for myself and it was pretty fantastic. It is a great way to really understand the differences, options and quality of the Hansgrohe products and I highly recommend! (Check out my Instagram video post here LINK) It is actually open to anyone, all you have to do is call up and make an appointment. After being “Wow’d” by “Showerworld” we were taken on a tour of their state of the art manufacturing facility and customer service center. I have to say I was impressed to learn that the average maximum wait time, when you call into their customer service department, is only 30 seconds. Once we began our tour of the manufacturing area it was clear to me that they take pride in their work and the product they are making. We even got to see their fancy PVD machines. PVD is short for Physical Vapor Deposition, which is a super scientfic machine that allows them to create their finishes and also enables them to create special finishes with superior durability. In addition to this very advanced technology the assembly process is all done by hand. Each and every faucet and fixture is put together, assembled, tested and packaged by hand. Their employees are all cross trained and most have worked for Hansgrohe for several years. After our factory tour we went back into the Aquademie training center to learn a bit more about Hansgrohe. 1928 - First hand shower with white porcelain handle – provided a convenient alternative to the overhead shower that had until this been the norm. It was truly a trend that made showering affordable for lots of private households. 1953 - Worlds First Wall Bar – during the years of the German reconstruction and economic miracle, the first Unica wall rod models went into production and was an absolute novelty. It enabled the hand shower to be attached at the desired height for the first time. Today, the shower bar is standard all over the workd in 1953 it was a bathroom sensation. Hans Grohe invented it at 82 years of age. 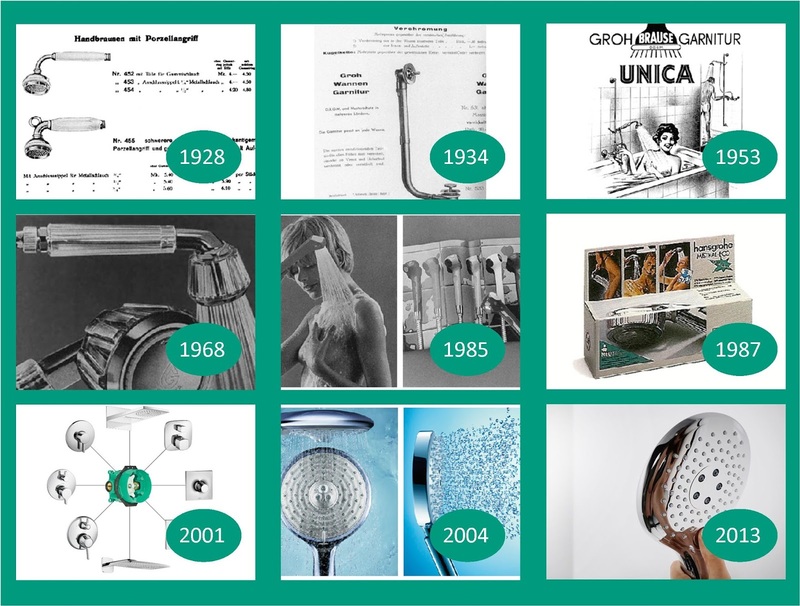 1968 - First Fully Adjustable Hand Shower – The worlds first hand shower with adjustable jet types went into prodctuion and more than 30 million Selecta hand showers have been sold and is still part of the product line today. 1987 - Mistral Eco Hand shower – long before everyone started talking about climate change, Hansgrohe developed the first hand shower that reduced water consumption by 50 percent the Mistral Eco. 2001 - iBox Universal - The iBox Universal revolutionizes concealed installation. To date, it is the first and only basic set for all standard and thermostat solutions. It is a one box solution! And in my opinion is brilliant. 2004 - Raindance Shower – Total shower fun the Raindance shower multi-talent becomes a trendsetter. Raindance with AirPower comes onto the market. This intelligent shower technology infuses water with air producing a shower that reduces the water consumption but it doesn’t feel like it. The plump, light, soft droplets rain gently down on the person showering, completely enveloping them. 2013 - Select (available and shipping in the USA 2015) creating an intuitive control with the Select button Hansgrohe allowing the person showering to select the jet type they want in just one click. In addition to the many Hansgrohe products they also have Axor, which is their luxury product line. The Axor brand represents the diversity and fascination of personal lifestyles in the bathroom. Axor basically takes Hansgrohe to the next level. 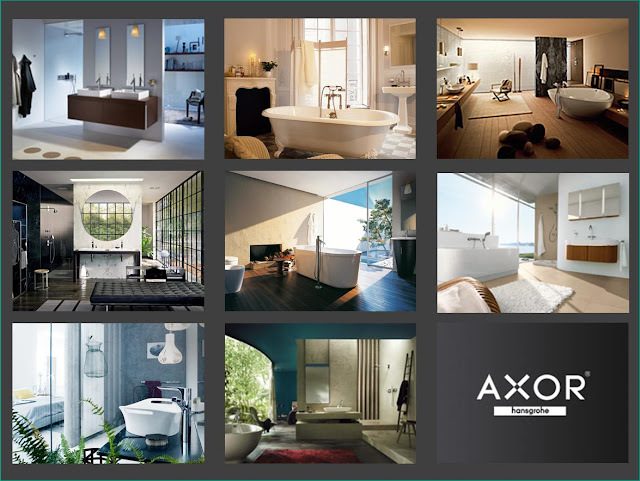 Axor is comprehensive and individual bathroom collections created in cooperation with some of the world’s most successful designers. These collections are as individual and different as people themselves, and offer multiple different styles - from lively, charming living rooms/bathrooms in one to nature-inspired havens of peace. Beautifully designed luxury for the kitchen and bath. Be sure to check out Axor ONE, it is the next, NEXT LEVEL!